These In The Hoop Goody Bag Toppers are easy to make and great for any kind of party. 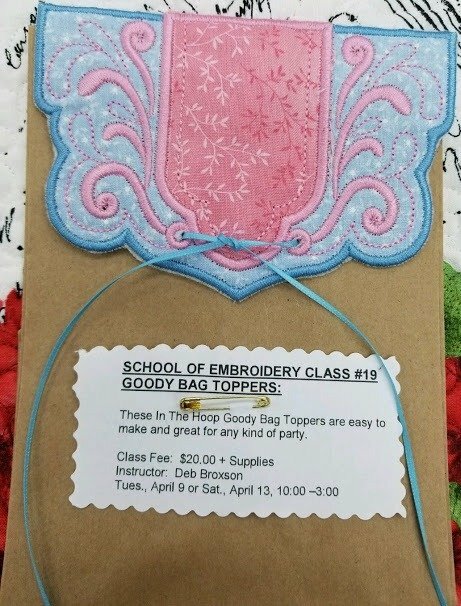 You really want to take part in all of the School of Embroidery classes to learn to get the most from your embroidery machine. These classes are meant to teach you about stabilizers, threads, techniques and more. Deb is a CERTIFIED OESD Machine Embroidery Instructor. Any brand of embroidery machine is welcome as long as you can transfer the embroidery design to the machine via USB stick. Please let us know what brand of machine you are bringing when you register so that we are prepared. Our classroom space is limited, but these classes tend to fill up quickly so registration is absolutely required. Please come by the store or call to reserve your space, 850-689-3655 OR 850-682-6920. This is a long class, please bring your lunch/snack.